We arrived at An Sibin in time to sit by a warm turf fire before dinner was served. 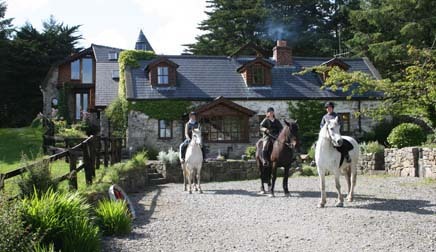 There were a variety of other guests from France, the U.S. and Canada staying and riding at An Sibin’s 300 year-old farmhouse near the River Shannon. I sat by the fire, casually reading, but also starring at the variety of rural antiques decorating the room. Nicola and her partner Bertie have restored the farmhouse, picking out everything themselves. It does have a fairy tale like setting, nestled among the mountains and forests, by the River Shannon. The next morning, we were matched up with our horses and ventured off into the Slieve Augty Mountains through the bog lands on route to an ancient Celtic Tomb. The dirt trail was lined with peat bogs on either side. Nicola explained the process by which people cut the peat the old fashioned, by hand. It’s cut in the springtime and dried over the summer. In the fall, they harvested it. We could see the different levels where the peat was removed in the lower areas and way up top it was black, where the peat was actually lying out to dry. It would take about three months to dry. Then, it could be brought home and used for heat. The fire the night before had smelled so nice and earthy. We continued down the trail, taking in views of the river far below, before reaching the megalithic tomb in a grassy area above us. 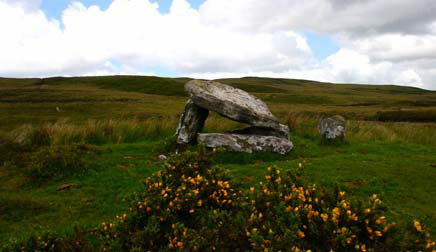 Nicola explained that there are tombs like this scattered all over the area. We rode up to take a closer look, hearing the moist grass squish beneath our horse’s hooves as we went off the trail. This particular tomb had not been excavated, so the archaeological treasures inside are a mystery. Back at the riding center, we enjoyed a bit of shelter before heading out for a night at the pub. We were in for a treat, because the locals at the pub played traditional Irish music, which believe it or not, can be hard to find nowadays in Ireland! 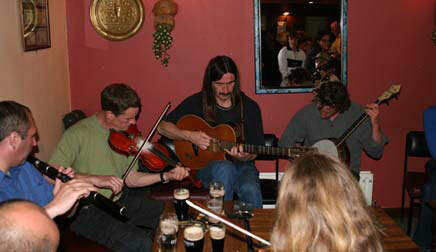 I had a pint of cider and enjoyed the local flavor of life in rural Ireland. 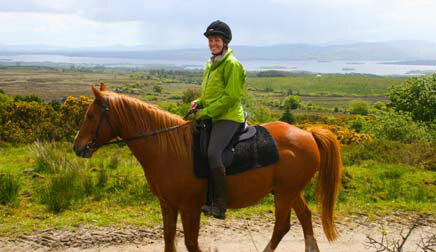 Learn more about riding in Ireland in County Clare. Darley Newman is an equestrian travel expert, published author and host and creator of the Emmy award winning Equitrekking TV series on PBS.